Fig trees enjoy warm weather and full sun. They can be grown outdoors in areas where winter temperatures do not drop below about 10 to 20 degrees F. They need room to grow, averaging about 10 to 30 feet tall when fully grown. They need well-draining soil and even irrigation. Most fig trees need little to no pruning; excessive pruning will reduce fruit production. Water fig trees every one to two weeks during the spring and summer, depending on rainfall and average daily temperatures. Water less frequently in the fall, except during periods of drought. Soak the ground around the base of the tree, extending out about 2 feet beyond the foliage. Apply a thick layer of organic mulch to help conserve moisture and control weeds. Pull weeds under the tree or cultivate shallowly. Fig tree roots are shallow and easily damaged by excessive cultivation. 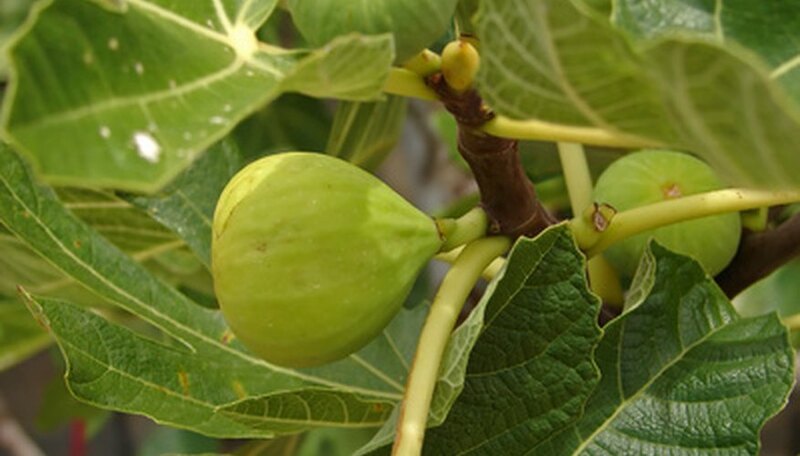 Fertilize fig trees only if the branches grew less than a foot during the past year. Use a balanced fertilizer such as 8-8-8, at a rate of 1 lb of fertilizer for every year of tree age, up to a maximum of 10 pounds per tree. Spread the application out into three or four applications beginning in late winter through early spring. Broadcast fertilizer on the soil beneath the foliage and water after application. Avoid fertilizing in the late summer. Train fig trees into an open vase shape in colder climates. Remove damaged or diseased limbs during the winter dormant season. Do not prune Celeste and Alma varieties. Protect fig trees during freezing weather. Cover the tree with blankets or burlap. Pick figs as soon as they are fully ripe. Check the tree daily during harvest season. Leaf wilting is a sign that your fig tree needs more water. Fertilizing or over watering in the fall encourages foliage growth and prevents the tree from preparing for winter. Fig trees can cause skin irritation. Wear long sleeves and gloves when pruning or harvesting figs.